Some brilliant racing during the seventh round of the Ulster Superbike Championship at Kirkistown on Saturday saw Gerard Kinghan complete a double in the Ards Council-backed Superbike races with the main silverware going to Roslea rider Andrew Brady, who lifted the Crown Prince of Kirkistown award for his victory in the second Pre-Injection eight-lap race. For Randalstown rider Kinghan, yet to win an Ulster or Irish short circuit title. His hard-fought double gave him an extended lead in this year's championship of 120.5 points over his nearest challenger, Dromara's Alistair Kirk, with three rounds remaining. A scrap in race one between Kinghan, Kirk and David Haire came to an early conclusion after they had completed six of the scheduled eight laps when the red flags came out to halt the race with 32-year old Kinghan declared the winner a fifth of a second clear of the McCurry BMW of Kirk with Haire back in third. Kinghan on his Kawasaki again did the business in race two ahead of Kirk and Haire. Brady meanwhile, was winning the Crown Prince Trophy for the fourth time and for the third year in succession taking a comfortable victory over Johnny Irwin with Derek O'Connell in third. Upperlands rider Jason Lynn (Walter Bell Yamaha) was a double Supersport winner, getting the better of Mark Conlin and Christian Elkin in third in race one with Simon Reid the top Cup runner in fourth. Race two was a repeat top three, this time Lynn winning by half a second after setting the fastest lap of the race at 96.437mph on the penultimate lap, while Elkin was some seconds behind runner-up Conlin. In a day of double wins Mark Hanna triumphed in both Supertwin races in which Glenn, Andrew and Graeme Irwin's brother Ross finished fourth in both. Paul Robinson, who has just announced his retirement from road racing, took both Moto3/125GP events, while Cookstown's Gary McCoy won both Lightweight Supersport races as did Cameron Dawson and Joshua Rae in Junior Cup and Young Guns. Jonny Hanna and Kevin Lavery shared the Production Twins races. In motocross Jason Meara from Loughbrickland won the Brian Bell Memorial race at Laurel Bank, Saintfield on Saturday with his MX2 rival Glee McCormick back in second and top MX1 runner Robert Hamilton third. In the Sport Insure/Precise Project MX1 Ulster championship races Lisburn's Richard Bird retained his title after winning all three races from Jordan McCaw who took three second place finishes. 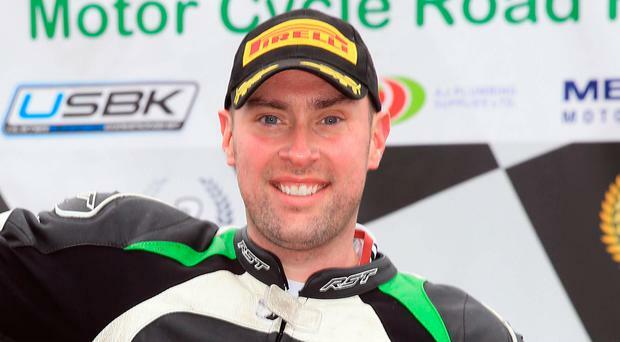 By Roy Harris Magherafelt's Paul Jordan has podium glory in his sights at the 2019 fonaCAB International North West 200 in association with Nicholl Oils.